Kim Nam Pyo (b. 1970) received both his B.A. and M.A. 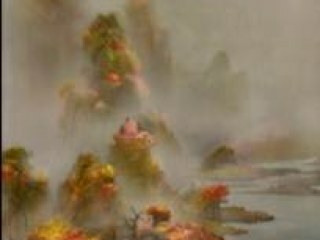 in Painting from Seoul National University. Kim's paintings appear to be super-natural still life depictions of animals, wildlife and various bodies of water intertwined with man-made consumer apparel such as shoes and bags. 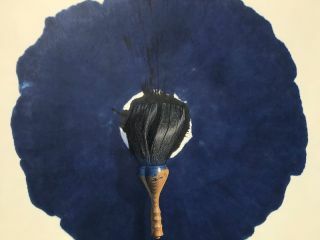 Deeply influenced by the art of traditional Korean ink painting, Kim pays homage to tradition by applying washes of black paint in a calligraphic, gestured manner yet adds a fresh approach by introducing bright bursts of color and applying faux black fur onto the canvas. Kim's work reveals a unique fusion of traditional Korean ink painting with his own organic and fantastical forms. Much like the meditative works of traditional Eastern ink painters and Western Modern art movements such as Abstract Expressionism, Kim's "instant"works are fluid expressions that are intuitive and not based on preconceived forms or ideas. As Kim puts it, "I like instant and spontaneous methods that lead from one to another, turning my paintings into logical results." 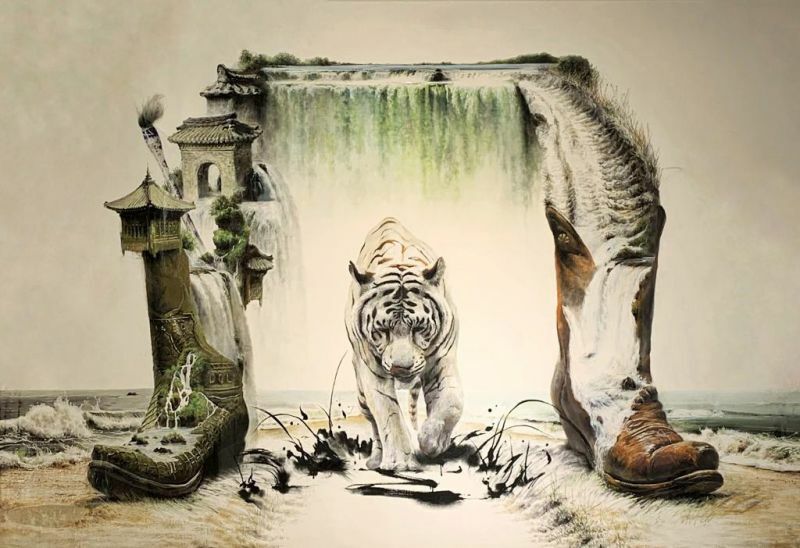 His interesting style of surrealism with his signature white tiger, with fur crawling out of the frame brings a tasteful experience to the viewers. The eyes of the tiger, focused on the audience, making it hard for you shift your eyes away! Yet, we are still attracted by the surreal background, composing of beautiful natural landscapes, flowing peacefully in the background.